The New Jim Crow: Mass Incarceration in the Age of Colorblindness (Hardcover) | Let's Play Books! Seldom does a book have the impact of Michelle Alexander's The New Jim Crow.Since it was first published in 2010, it has been cited in judicial decisions and has been adopted in campus-wide and community-wide reads; it helped inspire the creation of the Marshall Project and the new $100 million Art for Justice Fund; it has been the winner of numerous prizes, including the prestigious NAACP Image Award; and it has spent nearly 250 weeks on the New York Times bestseller list. 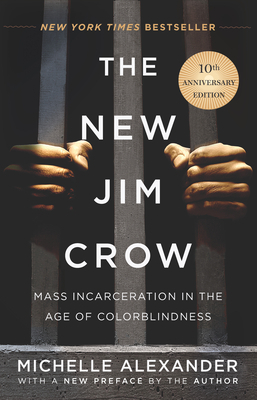 Most important of all, it has spawned a whole generation of criminal justice reform activists and organizations motivated by Michelle Alexander's unforgettable argument that "we have not ended racial caste in America; we have merely redesigned it." As the Birmingham News proclaimed, it is "undoubtedly the most important book published in this century about the U.S."
Michelle Alexander is a highly acclaimed civil rights lawyer, advocate, and legal scholar. She is a former Ford Foundation Senior Fellow and Soros Justice Fellow, has clerked for Supreme Court Justice Harry Blackmun, and has run the ACLU of Northern California's Racial Justice Project. Alexander is a visiting professor at Union Theological Seminary and an opinion columnist for the New York Times. The author of The New Jim Crow and The New Jim Crow: Young Readers' Edition (both from The New Press), she lives in Columbus, Ohio.